In your screenshots, your application is attempting to do a GET to the QA server, not the demo server. How come? The environment variables for the demo server are correct, and you should not do any requests to QA. This is happening when I hard refresh on the dictionary page it brings the console error which I don’t also seem to understand. @judeatu, there must be some place in code where qa is still hardcoded. You need to find that place and use OCL_API_HOST variable instead. 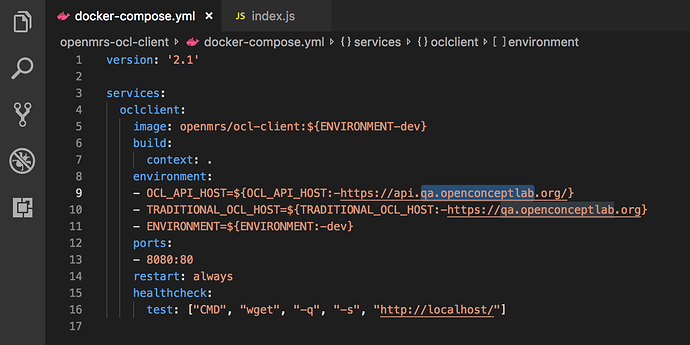 I’m a little surprised by the first error, the syntax error on env-config. That character is not even there? That first error is coming from public/index.html because of <script src="./env-config.js"></script> the file does not exist in public. When you refresh the page using the browser refresh that error pops up. Hey @raff. We found two places with qa. Just to be clear … should we change these two to “demo”? I think we shouldn’t be using ./env-conf.js rather /env-conf.js for the script path. It still brings the same error with that. No it’s not. I’ve just deployed the change and I can refresh without an error. I cannot do our usual Thursday calls this week or next. Next week I can do Monday, Tuesday, or Wednesday, either at the usual time or 1 hour later. Will one of those times work for people? 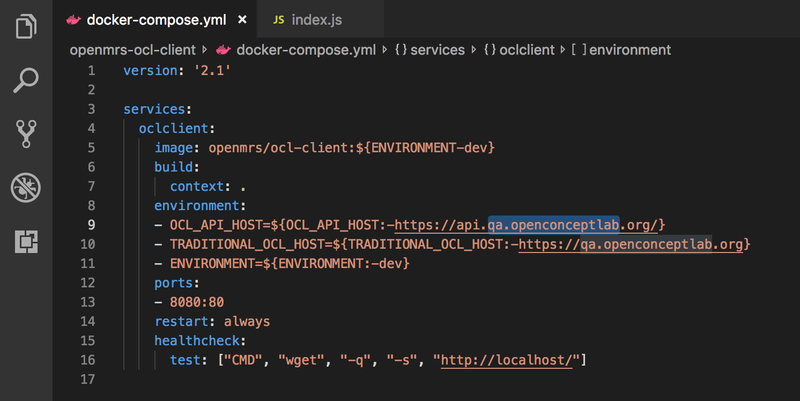 The docker compose file inside your repo is only used to do local tests. It’s not shipped to any server. You don’t want that using something that’s not QA. 5: 00pm - 6 : 00pm EAT** . In this sprint, we worked on the implement feedback provided by stakeholders towards accomplishing the MVP. Hello community, Here is the link to join the Sprint 17 Demo Call (5 pm - 6pm EAT) its starts in 20 minutes.
. Can we catch up next week on Monday, Tuesday, or Wednesday, in the same time slot, or 1 hour later? Yes, @darius I will schedule a call for that. @judeatu, the demo server has now full CIEL dictionary.